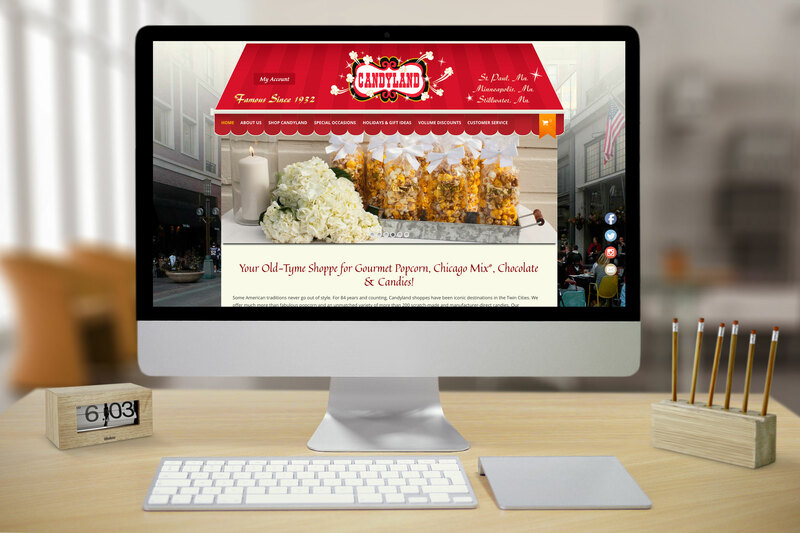 Candyland had an e-commerce website, but it has not been redesigned since 2003. They needed a more modern website that reflected their brand image online. Candyland was first opened in 1932, St. Paul. Originally named Flavo Korn and selling just popcorn and fudge. In 1950 it was renamed Candyland because of an expansion of products to include candies and chocolate. Doug and Brenda Lamb took over the business in 1981. They own the rights to the Chicago Mix® popcorn brand. They launched their first eCommerce website in 2003. 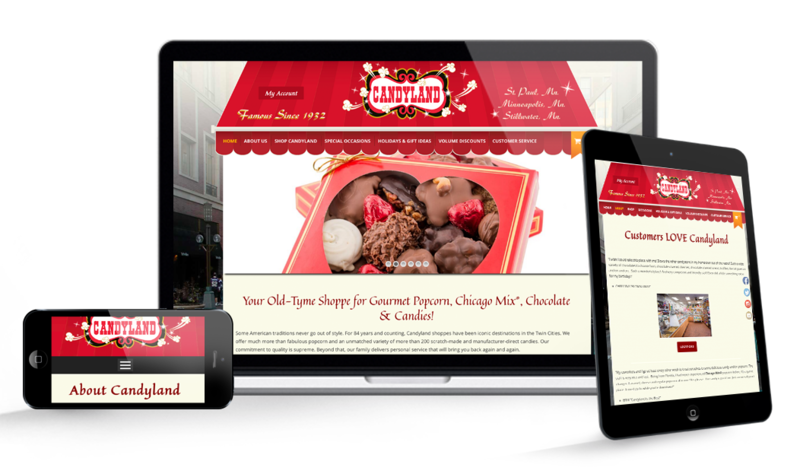 In 2016, Candyland began searching for a new website developer. They were dissatisfied with their current developer for multiple reasons. Mainly, it took 48+ hours to make changes to the website and changes were expensive. They also didn’t have backend access to update their catalog or website. 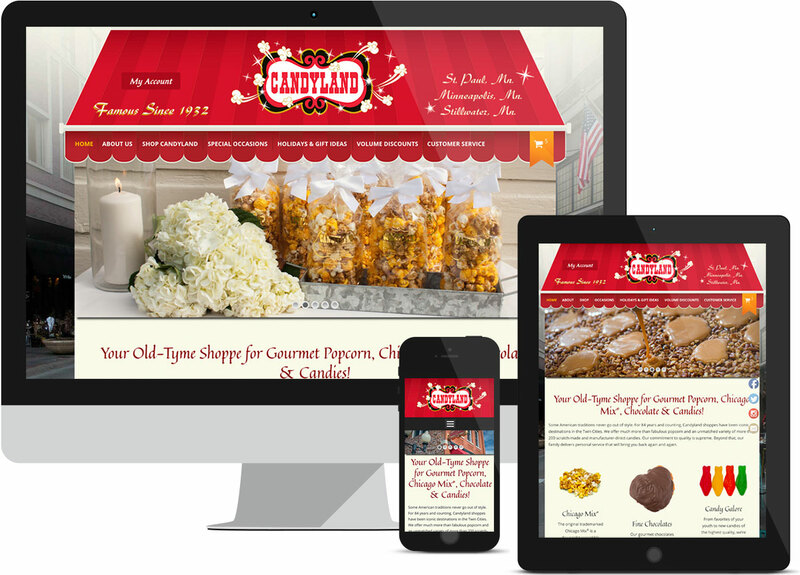 The new Candyland E-Commerce website features a more modern, custom design that is accessible across all devices. 2. Gain back control of their website. 3. Get fast, responsive customer service. Their first goal was to save money over the long-term. Because updates were expensive, they minimized the number of updates which slowed down the flexibility of Candyland to launch new products or communicate effectively with customers. In many ways, they were being held hostage by their developer because of their high dependency. Their second goal was to get responsive customer service. They began working with Iceberg Web Design that year. Click on a photo to view full size or visit www.candylandstore.com live. Through each step of the process Iceberg was responsive and accessible. The team went above and beyond expectations delivering the new website. The design was simple and created effective navigation. The reality is, when a customer can’t find what they are looking for quickly, they leave. The design was appealing and reflective of their personality as a vendor. While the look and feel are important, there are many other backend pieces (such as meta-tags) that integrate with search engines which also impact the effectiveness of the website. Because we use Wordpress and have an intricate knowledge of platform integrations, we can select the one that will fit best for your business. Candyland now has backend access and they can manage their own product catalog. The hosting platform selected was specifically selected on its ability to expand according to the amount of traffic they got. The website launched in September 2016 in time for the holiday season. As soon as it launched they began being ranked for 187 key words, compared to the old website, they had 83. In October, they got 5.4K clicks from search traffic every month. Through social media they announced the launch of their new website and leveraged through the rest of the holiday season. Simply put, because of all these improvements, their online holiday business doubled. At Iceberg Web Design, our unique sales process helps you reach your highest business potential. Our trained marketing experts can help you achieve your sales goals and generate more revenue through your website. Call today to set up a meeting with our marketing experts to start your e-commerce website project.